Lazaroff is a dynamic woman who wears many hats – restaurateur, interior designer, public speaker, mother, author, and philanthropist. Walking into each room in the restaurant, her presence and enthusiasm is felt by all. Wolfgang Puck and Executive Chef and Managing Partner Lee Hefter, have re-invented the entire menu with a new signature iconic California farm to table philosophy. 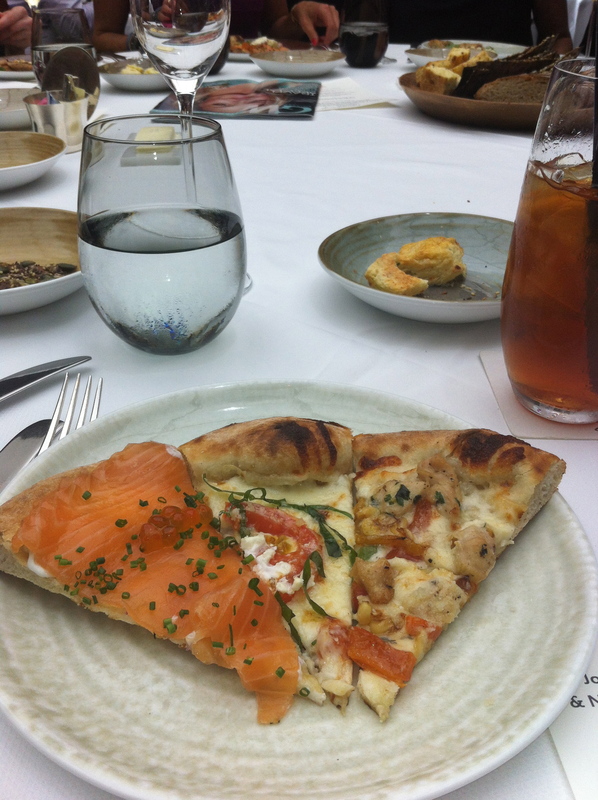 Sitting under a large skylight, we started our lunch with three different types of Spago’s famous pizzas. The house cured smoked salmon resting on dill crème fraiche was my favorite. I also enjoyed the chicken pizza with caramelized sweet corn and roasted peppers. You never know who will be dining near you at Spago’s. Guests dining with us in the main room became silent as Sir Sidney Poitier walked into the room and took one of the back booths. This Oscar winning actor, film director, author and diplomat enjoyed lunch with a friend. We savored the fresh burrata with a generous serving of prosciutto. The salad was presented with sliced figs, baby arugula and old balsamic dressing. I ordered the Alaskan halibut poached in mushroom nage (a mushroom broth used in poaching), and surrounded by sweet corn, braised pancetta and maitkake mushrooms presented on French earth color stoneware. The servers couldn’t have been more accommodating to guests. Each made sure our every culinary wish was fulfilled. 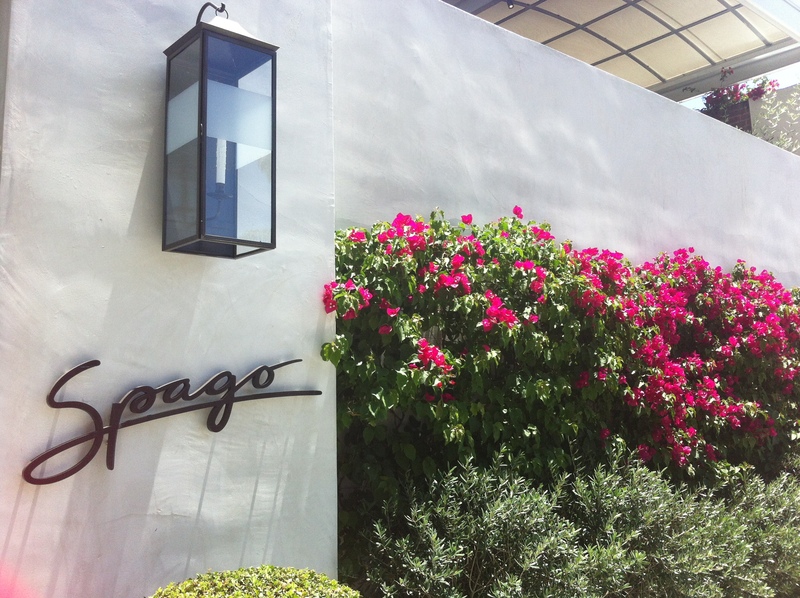 The service at Spago’s is comfortable and attentive. Our dessert plate consisted of scoops of housemade farmers’ market sorbet with berries, sliced summer plums and flowers was visually stunning and very refreshing as the temperatures outside reached 90 degrees. For those interested in Barbara Lazaroff’s event, it’s on July 28 at 4 p.m. at the Pacific Design Center. Dine al fresco with live music, silent and live auctions. Due to her culinary connections, Gino Angelini of Angelini Osteria and RivaBella will be preparing dishes with Rene Mata and Julian Saldana from Chinois on Main. Ari Rosenson and Hugo Bolanos of CUT, Rick Bayless from Red O, Mohan Ismail from RockSugar Pan Asian Kitchen and many more. Tickets are $350 ($250 tax-deductible). For more information, visit CalSpirit.org. The Pacific Design Center is located at 8687 Melrose Ave. Lunch is served on Tuesday, Wednesday, Thursday and Saturday from 12 p.m. until 2:15 p.m. On Fridays, lunch is served from 11:30 p.m. to 2:15 p.m. Dinner is served from 6 p.m. to 10 p.m. Sunday through Friday. Saturday dinner service begins at 5:30 p.m. until 10:30 p.m. Happy Hour in the bar starts at 9 p.m. until 11 p.m., Tuesday through Saturday. $$$ 176 N. Canon Dr. (310)385-0880. Published in the July 18, 2013 issue of the Beverly Press and Park LaBrea News.